It is time to celebrate: This spring issue is the 50th issue since the very first FUN. 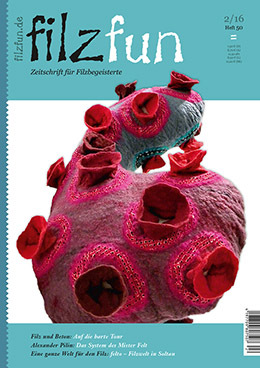 Scope, layout, and even the name changed over the years – but the filzfun is still a unique magazine in the German speaking regions that exclusively covers all the facets of felt making. The fascination for the versatile material speaks from all pages of the issue. 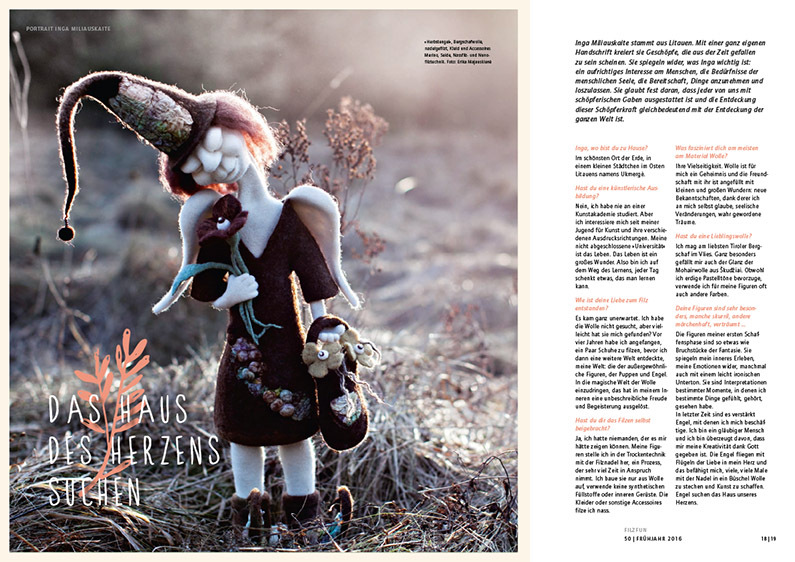 The cover is graced by a sculptural object made by the Canadian felt artist Jennifer Tsuchida, who loves Nuno felting and who has lost her heart to designing figures with plastic shapes. As one of the few men in the felters’ scene, Alexander Pilin has made a name of himself as a master of his trade. His sense for originality and technical qualities turn his high-fashion designs into real artwork. Margarete Warth experienced the development of the modern felters movement in Europe almost from the beginning. Her artistic approach is reduced, her working is versatile, and she is still today very much connected to the material felt and its possibilities. Inga Miliauskaite is at home in Lithuania. With a very unique signature she creates creatures, which seem to have fallen out of a certain time, in order to touch humans hearts. Karoliina Arvilommi and Roderick Welch are from Finland. They developed their own production of thick, strong felt with round edges, harmonic colors and decorative patterns. Really colorful are the wearable artworks by Ulrieke Benner, who also knows the healing power of colors and uses them knowingly. Felt, as far as the eye can see: At the Filzwelt felto (Feltworld) – Filzwelt in Soltau, which opened its doors in 2015, visitors can experience felt with all their senses in an interactive exhibition. Woolways-Show and the African Fashion Week in Amsterdam. A one-of-a-kind challenge was the Fashion Art Toronto for two felt and textile artists; they had to felt ten sculptural garments in only nine weeks. 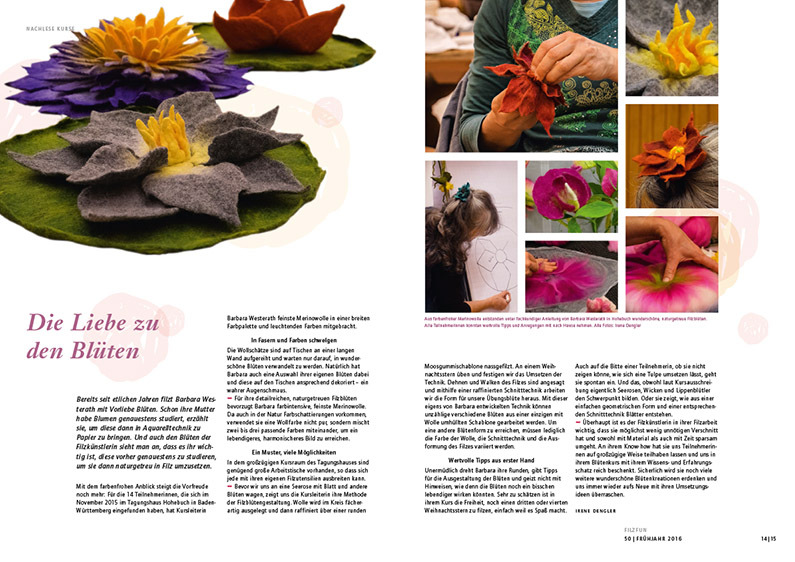 In our workshop report we have a closer look on two workshops with worth seeing results: Within the feltfestival Berlin, Klaudia Al-Halawani tried the combination of felt with hard concrete and Barbara Westerath conducted a workshop in Hohebuch about creating lifelike blossoms. A review of the felters meeting in Pians with an outlook on the current event in the border triangle is another topic, as well as the story about the Swedish Fine Wool Sheep and the quality of its wool. 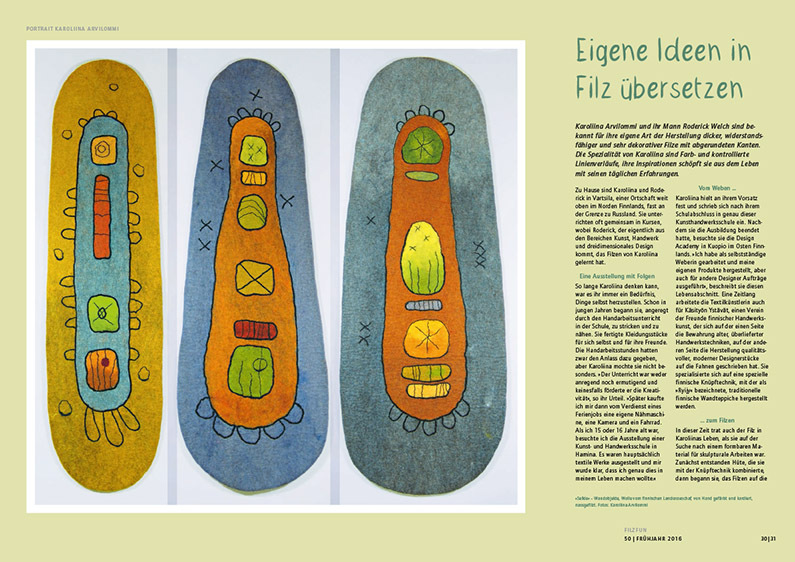 Ricarda Aßmann presents the Bingo-Wings-Line by Charlotte Sehmisch, while Beate Bossert shares her experiences with silkworms and their breeding. 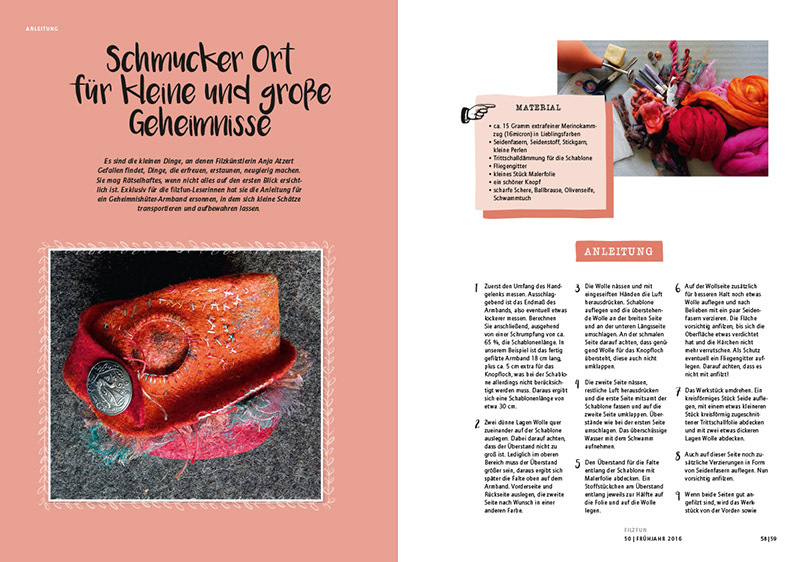 If you would like to start working with mind and soul after this rich reading, you can start with the exclusive instruction by felt jewelry expert Anja Atzert and make a special bracelet!